Andrew Rothman is a proud native of Cleveland, Ohio. He's been playing drums, singing, and acting since the early 1980s, taking photos since the early 1990s, and designing websites since the late 90s. He holds a BFA in Electronic Media from the University of Cincinnati College-Conservatory of Music. Drew's day gig since 1998 has been as something of a 'jack of all trades' with Main Sequence Technology in Willoughby, OH (developers of PCRecruiter), where his roles have included advertising, marketing, web design, video and audio work, customer support, documentation, business development, and product development. Outside of the office, Drew can be found acting and making music in professional and volunteer capacities around the Cleveland area and online. 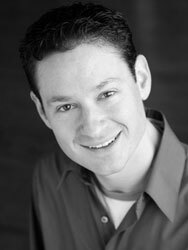 He has served on the Board of Directors at Chagrin Valley Little Theatre where he handles the Theatre's digital media. Drew will be returning to playing drums and singing at Pickwick & Frolic in 2017. He's also actively composing music for podcasts, most notably those by Mike Bennett. Chagrin Falls Studio Orchestra at the Hermit Club - "Bobby"
Interplay Jewish Theater (at The Maltz Museum) - "Major Freddie"
Interplay Jewish Theater (at Dobama) - "Trevor Stevens"
Interplay Jewish Theater (at Dobama) - "David"
Interplay Jewish Theater (at The Maltz Museum) - "Chaim"
Cleveland Public Theater (Big Box Series) - "Hector Berlioz"
Chagrin Valley Little Theatre - "Jamie Wellerstein"
Chagrin Valley Little Theatre, co-wrote with Greta Rothman, starred as "Inspector Gotcha"
Notre Dame College - "Doc O'Connor", "Fred Phelps"
Weathervane Playhouse - "Jamie Wellerstein"
Chagrin Valley Little Theatre - "Eugene Morris Jerome"
Chagrin Valley Little Theatre - "Rapunzel's Prince"
Pit drummer for various productions, including The Rocky Horror Show and Seussical at CVLT, and Reefer Madness at Blank Canvas. Drummer with Melocotón, latin/carribean/rock/jazz fusion. Finalist for WJW Fox 8 Cleveland Idol 2008. Composed the theme music for the .NET Magazine podcast. Won the 1973 edition of the 'Coverville Idol' contest with a cover of the Temptations' Papa Was a Rolling Stone. Composed electronic soundtrack for the lunar landing program at the Shafran Planetarium at the Cleveland Museum of Natural History. Performed as drummer for Nu-Hu, reggae band. Composed/recorded 'Our American Dream', and subsequently composed background music and engineered/produced the highly-acclaimed 'The Talkative Turtle and Other Tales' for, Kulture Kids. Performed as drummer/backing vocalist for Serious Aeolian Belfry (1999-2002), a quirky rock/r&b/jazz/jam/reggae outfit which was a semi-finalist in the Rock & Roll Hall Of Fame Battle of the Bands and performed both New Years Eve and Thanksgiving at The Grog Shop in 2001 and 2002. Want to get in touch? Email drew@arothman.com. Look Drew up on Twitter, Facebook, Instagram and SoundCloud.